2017 is soon over - and this has been an interesting year for the e-paper industry. We continued to see the trend that began a few years ago - with the focus of the industry on signage and retail applications rather than e-readers, even though the e-reader market is stronger than expected. While E Ink is certainly the clear leader in the e-paper market, some companies are developing what they hope will become next-gen e-paper displays. Bodle, based in Oxford, UK, is developing a technology it calls SRD, based on research that started in Oxford University a few years ago. SRD, or Solid-State Reflective Displays, creates color using light interference inside an ultra-thin film. The film contains a phase-change material, the same one used in writable CD-R discs. When this material is switched between its amorphous and crystalline phases, the color is changed. Update: It turns out that the wordpad does not use a display at all, it only includes a touch sensor onto which you place regular paper that you write on. 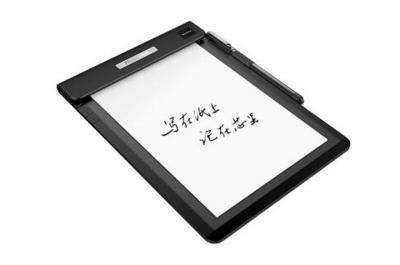 The Royole RoWrite wordpad (RO-F930-A) is an E Ink (~10-inch) powered tablet that includes memory for about 40 notes, and it can transfer these to both iOS and Android devices (via Bluetooth). It seems that the display is 9.7" in size. The RoWrite will ship in China on December 22, for 799 yuan (about $120).